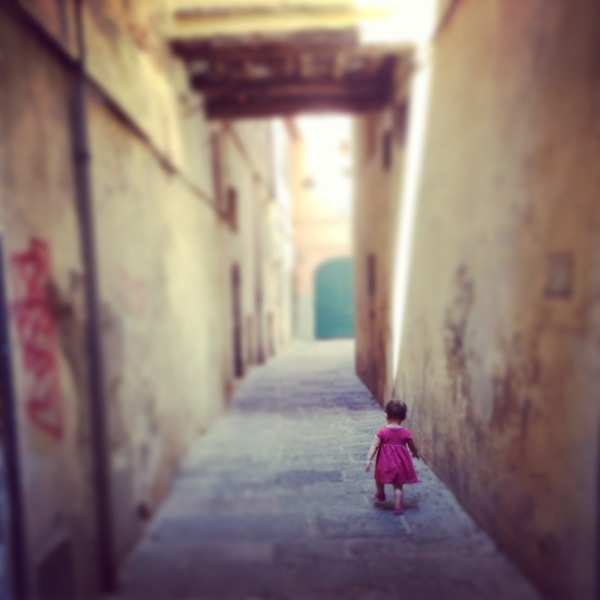 For our holiday in Tuscany, I set myself the challenge of telling the story of our week using only my iPhone 5 and the standard effects and filters available via the popular social photo sharing app Instagram. So here are my favourite shots, with a few words of commentary on each. This was the third time we’ve been to Tuscany. This panoramic view from the front terrace of our villa, where we ate every day, goes some way to explaining why we keep coming back. A spectacular view, with the only audible sound the chorus (sometimes cacophony) of crickets. We had our own swimming pool (which you can see bottom left), which was a prerequisite of our holiday. More on that later. In addition to the five of us, we went with old university friends who also have three kids. Their youngest is a week older than our oldest (Isaac), giving us a spread of ages ranging from 12 to just 15 months (Kara). All six spent the entire week looking out for each other, with the youngest five (pictured) in particular spending hours upon end doing stuff together. Not only did this help lighten the parenting burden, but I think they had a lot more fun as one big gang than they would have done with just their respective siblings to play with. At the ripe old age of 15 months Kara is now a high-speed toddler who isn’t afraid to run and climb everywhere. This shot was taken in a narrow street just off the cathedral square in Lucca. As is now typical of her, she wasted no time in charging off to explore for herself, not even bothering to check if I was following her. For foodies, Italy is nirvana. Natural, unprocessed, simple ingredients combine to form mouth-watering flavours. 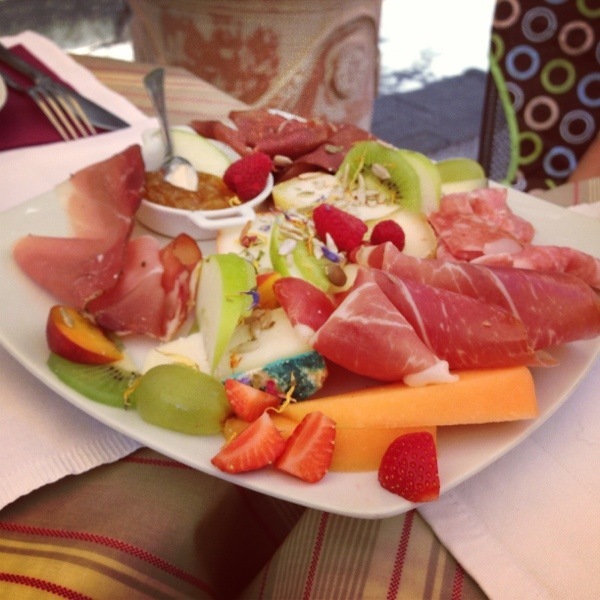 This antipasti dish, served at Bistrot Paris Bohème in Lucca, was our favourite: the standard cold meats (salami, bresaola and prosciutto) served with a variety of bruschetta, cheese, fruit and fig jam. Delicious. While many of Italy’s cities are drab, characterless concrete jungles, large swathes of the country wear their age like a badge of honour. There’s nothing artificial about the state of distress common to any centro storico (old town). 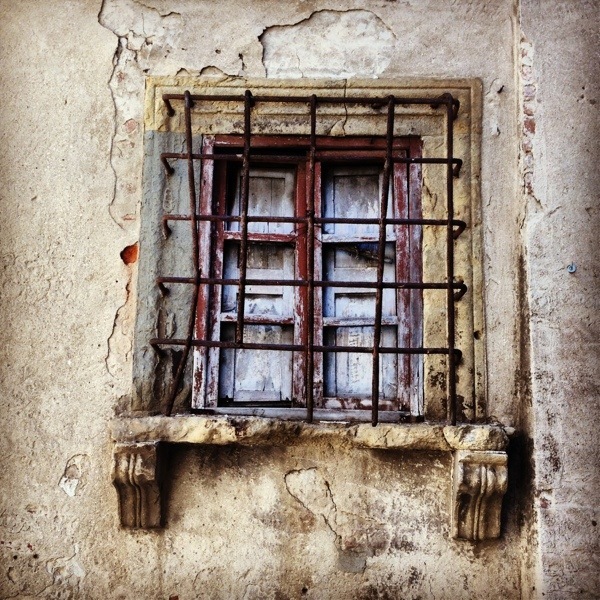 This window was one that caught my eye while wandering around the 14th century hilltop town of Certaldo. The more modern and dominant part of Certaldo which sits at the base of the hill has all the conveniences of modern life but not one iota of its predecessor’s history or charm. The pool soon became the hub of our entire week as we settled into a routine of post-breakfast and pre-dinner swims. Kidney-shaped and comprising three levels, it was ideal for older swimmers, learners (Isaac) and waders (Kara) alike. When I asked Isaac yesterday afternoon what his favourite thing about the holiday was, he immediately said the pool. (Which is quite something, given his deep-rooted love of pizza.) Having not yet mastered swimming pre-holiday, by the end of the week he was doggy-paddling seven metres on his own. Water wings well and truly earned! The shallowest level of our pool was a gently sloping beach-like paddling section, which was ideal for Kara. 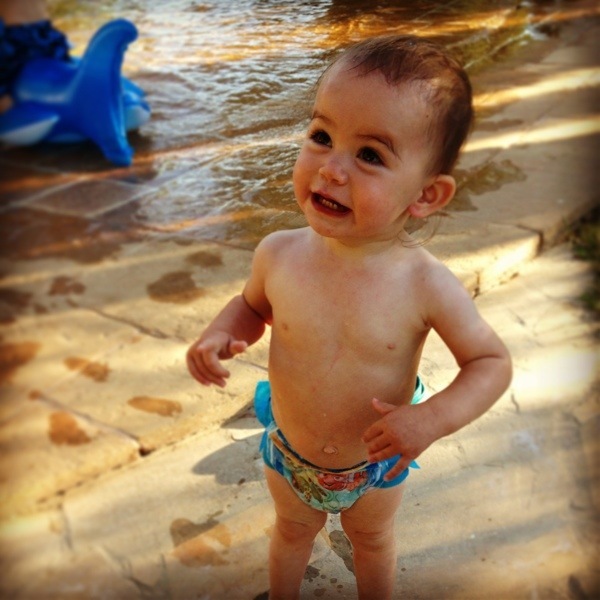 From there she could watch on as the other kids swam and splashed about, while pottering around doing her own thing, which mostly seemed to involve trying to drink every last drop of salt water from the pool. Nonetheless she wore a smile like this the whole week. And that’s it. Eight images for eight days of holiday, all captured with a simple smartphone. We fly home later today. More detailed thoughts to follow. 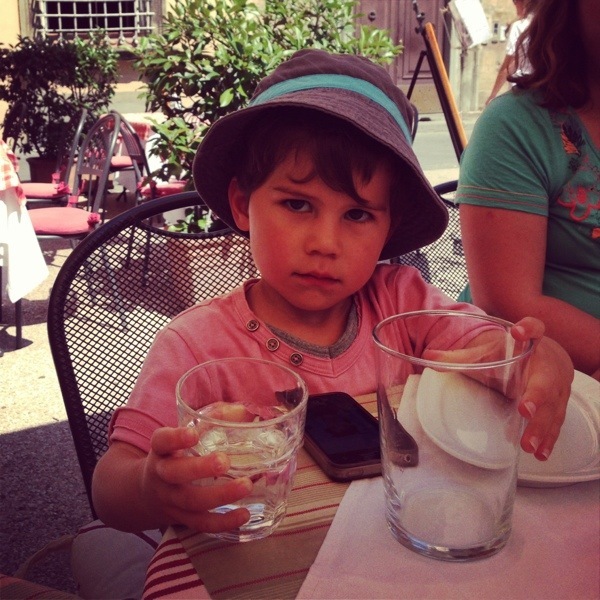 Posted in A dad's life, Travel and tagged Certaldo, family, fatherhood, Holiday, Lucca, parenthood, Parenting, San Gimignano, Tuscany. Bookmark the permalink. Looks wonderful; hard to narrow it down to 8 photos I expect! I love the third photo of your little one trotting off down the street, it’s a really great picture. So typical at that age, they have no sense of risk or danger, they just completely trust that they will be fine. Funny, in my WordPress reader for this post, it wasn’t one of those 8 photos that showed up, it was a photo of a different plate of food. That’s my favourite type of food, plates of cold meats and cheeses and stuff. You saying about the coming of age with Toby, I noticed a different sort of coming of age with my two this year as well, they’re 14 and 11 – we went to the same resort on the same Greek island that we went to last year. Last year, in every restaurant, my two were offered kids’ menus (not that either of them have eaten from kids’ menus for several years now), and this year, not one place offered them kids’ menus. That one year made a complete difference to how they were perceived. Funny how going back to the same place can provide you with different experiences – we’ve found the same even in the short time with ours. Good spot on the food photo. I’ve swapped in the correct one now. I’m never writing a photo-heavy post on an iPhone ever again! Really like this idea for structuring your holiday blog post. I keep thinking that I should include more photos in my blog posts, so might do something similar sometime. So true, must make it so much easier to get a blog post up quickly just after coming back from holiday too! Those are lovely Tim. I remember a particular vacation we took to the Ozarks when our kids were young, with school mates whose children were stairstepped between our own. It was tremendous fun, for them and for us – even though ten days before we found out their oldest might have contracted chicken pox, and indeed she had. And then, of course, both of ours came down with it on return. This was before there was a vaccine, and many people used to expose their kids to other kids to get it out of the way before school, but I still felt guilty. And yet. There was such love and companionship between our two families at the time, and the mountains were lovely. It was fun to relive that sort of thing in your pictures. Hope the 2014 vacation, if you are fortunate enough to get one, goes equally well. Thanks Paula. I’ve long maintained that 99% of the time it’s the person behind the camera that makes good photos, not the camera itself. Not that I’m a great photographer, but I’ve found I have a reasonable eye for candid portraits of my kids, for which a cameraphone that you can whip out at a second’s notice is invaluable. Without my phone, I would have missed so many little moments over the past few years, and while the technical quality isn’t as great as with my SLR, a so-so photo is always better than none at all. As long as everyone gets along fine it’s a great idea to holiday with another family. I have never been to Tuscany and judging by your photos it looks really beautiful…I never knew iPhones could take such decent pictures! The shot of Cara making an escape is favourite. I like the contrast of her pink dress against her blurred out surroundings….And to think she almost made it! Your photo of the window reminded me of someone I know who spends there holidays taking pictures of interesting doors!…Love it! We had a great time, and in fact we’re heading out this weekend to do the same thing again in France. 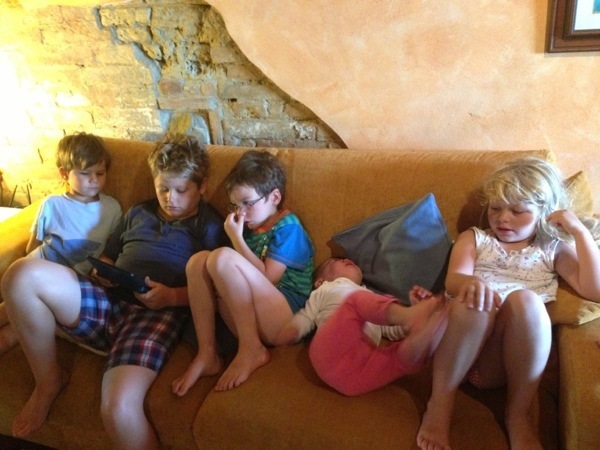 The family we went with are old university friends of ours – we’re godparents to each other’s kids so all the children know each other well and get along great. iPhones (and most other smartphones) are actually pretty decent cameras in most conditions, and with some basic camera skills can be just as good as at least a normal compact camera 95% of the time. Plus, of course, I always have mine to hand so it’s ready to capture any spontaneous moment. With young kids like ours, that’s a godsend. i hope you have a really great holiday and come back feeling all refreshed and newly inspired! Looks like you had a lovely holiday. What a great way to record it. Wishing you all a lovely time on this year’s adventures.